Download atomicrobotshareware.com FTP Professional Edition 3.0 - $20! 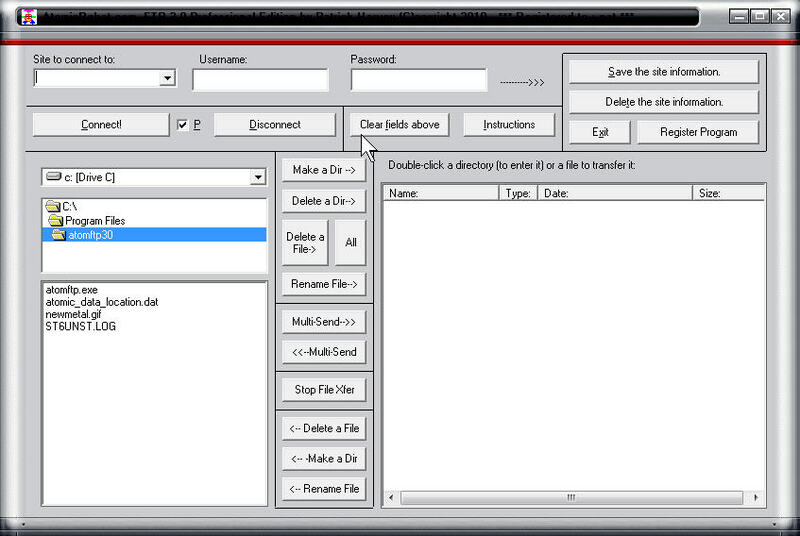 Register/buy atomicrobotshareware.com FTP Professional Edition now! 2) Transfer one or more files at a time from a folder on a web server to your PC. 9) Save you login information for each of your FTP sites. Remember, you have 30 days to try out the program to see if it suits your needs. Registering the program will remove the introductory nag. Get this one! You'll love it! Helpful tech tip: When transferring files to a server, if things seem to stop, freeze, or behave in an unusual manner, place a check mark in the "P" check box (passive transfer) and then reconnect to the site. The files should then transfer without issue. Helpful tip: When transferring files to a server, if things seem to stop, freeze, or behave in an unusual manner, place a check mark in the "P" check box and then reconnect to the site. The files should then transfer without issue.